Sue Peterson (handler) with Acting Greyhounds WA chief executive Barry Hamilton and Penny Monelli. VETERAN trainer David Hobby recorded a huge result when he claimed the first three placings in the WA Bred Championship final (520m) at Cannington on Saturday. 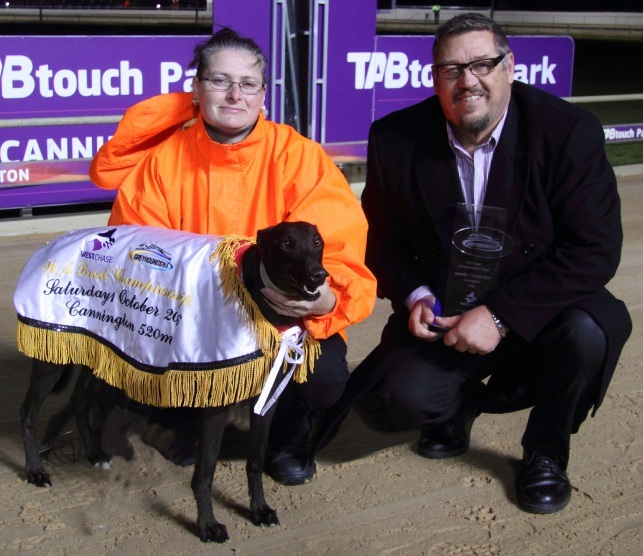 Penny Monelli ran a superb race along the rail to capture the silverware and her kennelmates Monaro Monelli and Teddy Monelli put the icing on the cake by filling out the remaining spots on the podium. A sweet jump out the traps saw Penny Monelli land in front but she was immediately tackled and overtaken by Pepper Fire as they passed the post the first time. The pair battled through the turn and in the early section of the back straight before Penny Monelli clicked up a gear and surged into the lead. With clear air ahead of her Penny Monelli kicked away and she won comfortably by more than three lengths in 30.13 sec. Both Monaro Monelli and Teddy Monelli came from near the tail of the field with strong finishes to grab second and third place respectively. Penny Monellihas had great start to her career with nine wins from 15 attempts and she has already banked nearly $40,000 in stakes.